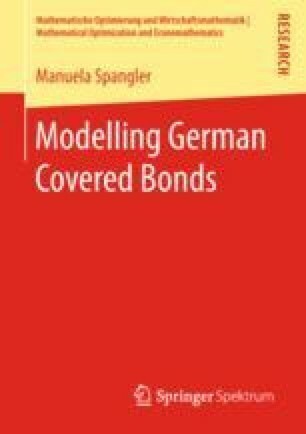 This chapter is focused on an exemplary model calibration for Mortgage Pfandbriefe. In Section 5.1 we describe how the bank’s balance sheet profile can be derived based on publicly available data and on expert opinion. Section 5.2 then addresses the calibration of the market environment, i.e. the determination of the parameters of the risk-free interest rate dynamics and the state variable processes of the bank’s risky assets. In Section 5.3 the generation of the stochastic scenarios of the market environment is specified.